I bet you didn't know a fairy tale exists that's a male Cinderella story. 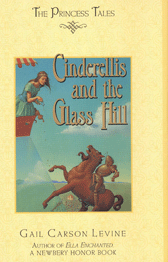 It's called "The Princess on the Glass Hill," and the main character is Cinders Lad, and he has two mean brothers. They're not his stepbrothers, and there is no evil stepmother, but they make his life miserable. I had fun with fairy tales in general in this book. King Humphrey IV keeps going off on quests found in other tales and returning with trophies that are not quite right. There's a prince test here too that's about as silly as the princess test in "The Princess and the Pea." The prince has to ride a horse up a glass hill, and the princess has to sit on top. What do you think she's doing up there?